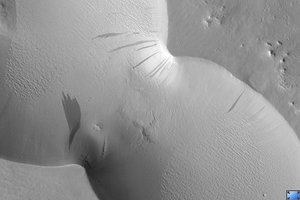 This HiRISE image ( PSP_003239_1870 ) reveals slope streaks in an area south of Olympus Mons in the northern hemisphere of Mars. These features are found along the slopes of impact craters, buttes, knobs, ridges, and troughs on Mars. Streaks generally start at a point source and widen downslope, traveling over and sometimes around various obstacles. The subimage shows a very wide dark slope that has developed small fingers at its terminus. The dark slope streak does not appear to have relief and does not disturb the pre-existing surface leaving the underlying topography intact beneath its dark trail. This can be seen particularly well near the streak termination. There are also no observable deposits of displaced materials along the terminus. Surrounding the dark slope streak are multiple ~1 meter deep, triangular faceted scars left behind from avalanched slope materials. The high standing remnant surfaces on either side of the lower scarred surface are clearly visible. Avalanche scars are sometimes found in areas where slope streaks have formed but they are believed to be unrelated. The trail of the dark slope streak appears to cross over the avalanche scars suggesting that the slope streak formed more recently. Slope streak formation is among the few known processes currently active on Mars. While their mechanism of formation and triggering is debated, they are most commonly believed to form by downslope movement of extremely dry sand or very fine-grained dust in an almost fluidlike manner (analogous to a terrestrial snow avalanche) exposing darker underlying material. Other ideas include the triggering of slope streak formation by possible concentrations of near-surface ice or scouring of the surface by running water from aquifers intercepting slope faces, briny liquid flows, dry granular flow, mixed water-dust flows, and/or hydrothermal activity.